Q. There is a video circulating on whether the two people behind one of Trump's rallies is John F Kennedy Jr and Caroline Bessette. It's also thought that they never died in the plane crash in 1999, but escaped to hide in anonymity. 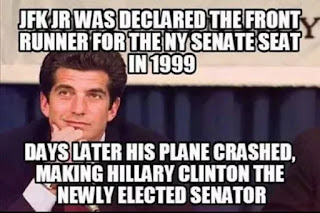 JFK Jr and Trump are working to together to defeat the cabal. Here are a couple of links to explain. It sounds too good to be true but, the clues on the Q board are too coincidental.